During the 16-bit era, a fierce battle was waged between Nintendo, Sega, and NEC, but did you know that Taito was considering entering the fray with a console of their own? In 1992, they announced the Taito WOWOW, a CD-based system that would make thorough use of satellite technology. The console never got past the prototype stage, but it's interesting to see Taito was floating such a system. You can read more about the system and its history here: Interview with Yukiharu Sambe, R&D manager of the unreleased Taito WOWOW. 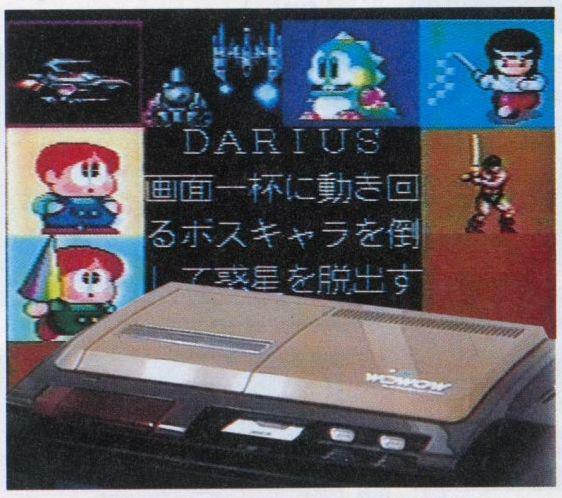 A console from Taito would have been cool, not sure about that name! What do you mean? You're not wow'ed by the name WOWOW? Nice interview, sounds like it didn't get very far, the hardware got the most work by the looks, just pure arcade parts to run earlier Taito arcade games, only the menu and Darius running from what i read, although nice in theory it would have seemed very outdated had it launched around 1993, there was no retro nostalgia to have helped it back then! I thought it was fascinating to see they even tried to make this. Clearly, the realized it couldn't get far so they stopped development. Yeah i think that's down to the satellite transfer being problematic rather than the hardware being outdated, i don't think it would have ever come west even if it had launched, though of course its nice to dream of a what could have been a Taito only console! What a collectors item that would have been. He my guys you coming over the play the Wowow lol.